If you can’t tell from the photo above, what is lacking is anything. 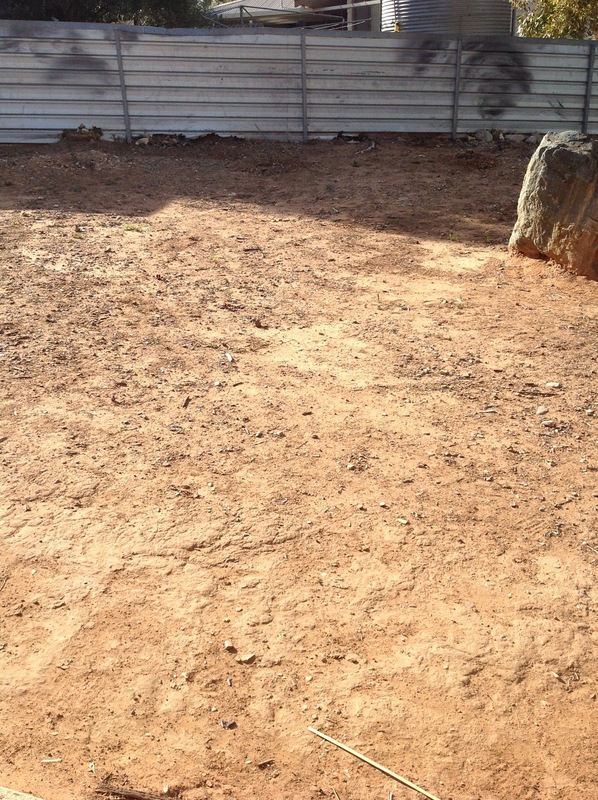 Despite the work I have put into some areas, most of the yard is either a desolate dust bowl or covered in weeds. 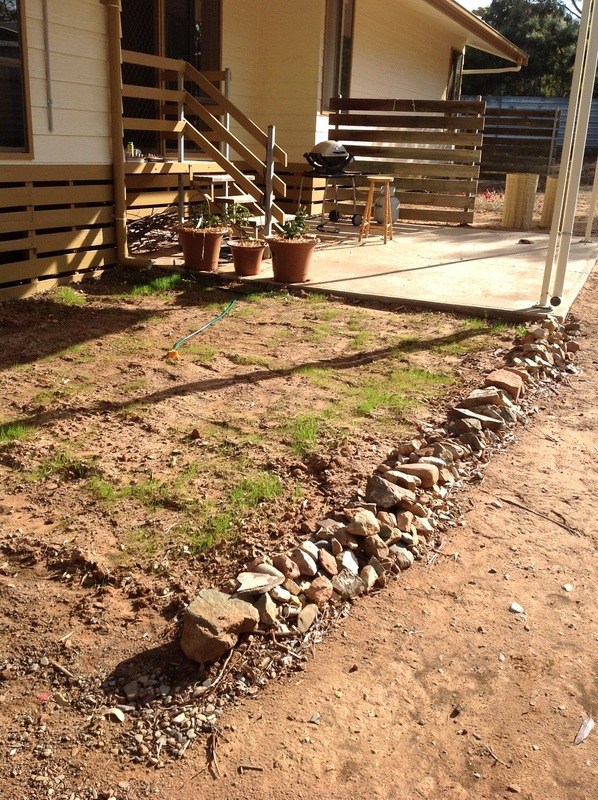 In an effort to affect some change, Joel decided to attempt to grow some lawn using a box of seed we had in the shed. Although some people cry “Lawn? How dare you! What an environmental nightmare! ” and while that may be true in some sense, I still can’t get past the idea of having a nice, green, soft lawn to stand on. Also, although I am in the desert, thanks to Aroona dam, water shortage is not an issue for the town and sustainable watering practices, such as grey water recycling, are practiced on the school and town ovals. In short, I don’t feel guilty watering my small patch of lawn. Anyway Joel spent a few days digging up the earth, removing the rocks and then sowed the seed and so far it has been a rather successful endeavor. The lawn seed has germinated, mostly, and is looking better and better every day. 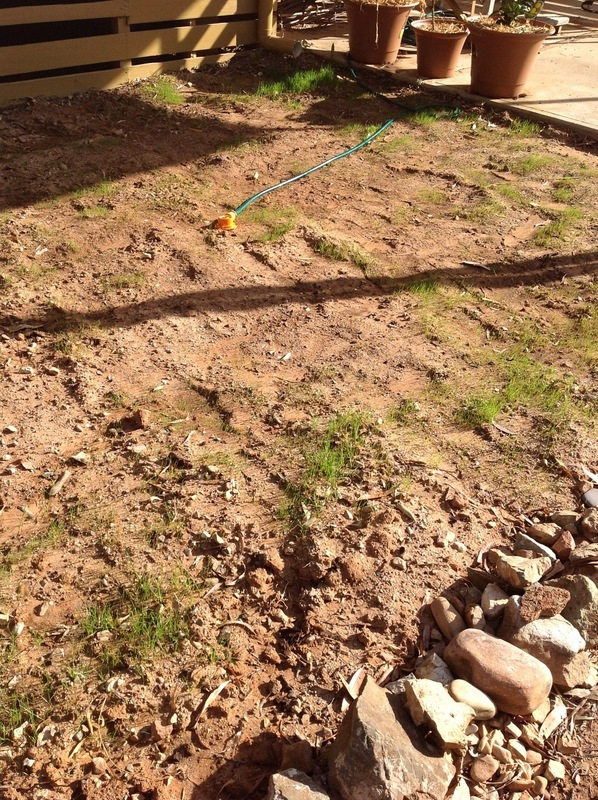 Hopefully by summer the lawn will be relatively established and ready to face the heat. 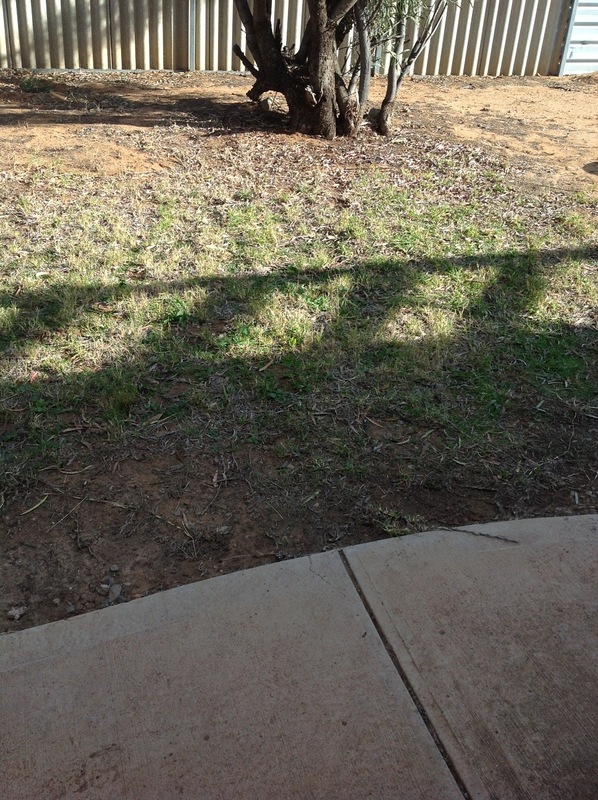 We also have a small scraggly patch of lawn out the front that is coming back to life wit the warm weather and occasional watering, so hopefully that will spread and look nice in a few months. I’m almost finished The Slap by Christos Tsiolkas. 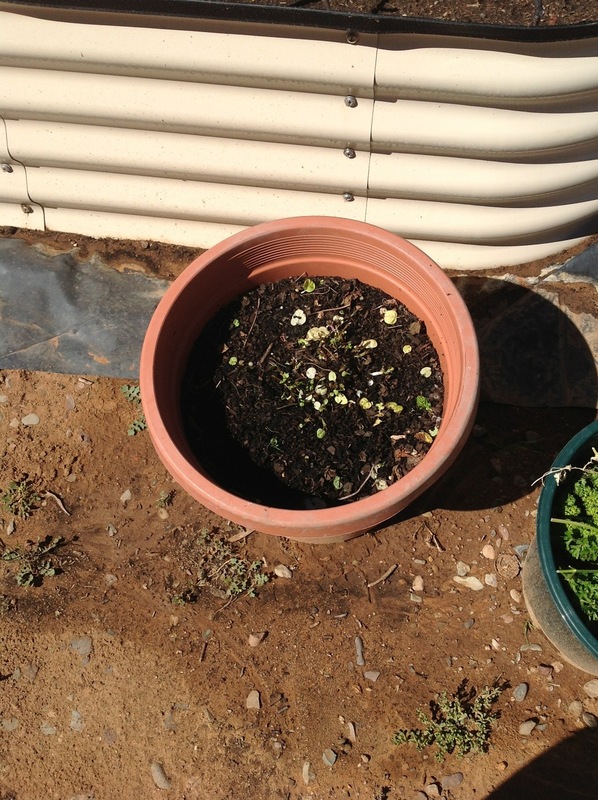 According to the Gardening Australia Vegie Guide and the tv show, now is the time to plant celery in arid Australia, not really sure I quite believe this thinking of celery as a cool season crop, but I’ve decided to give it a go. 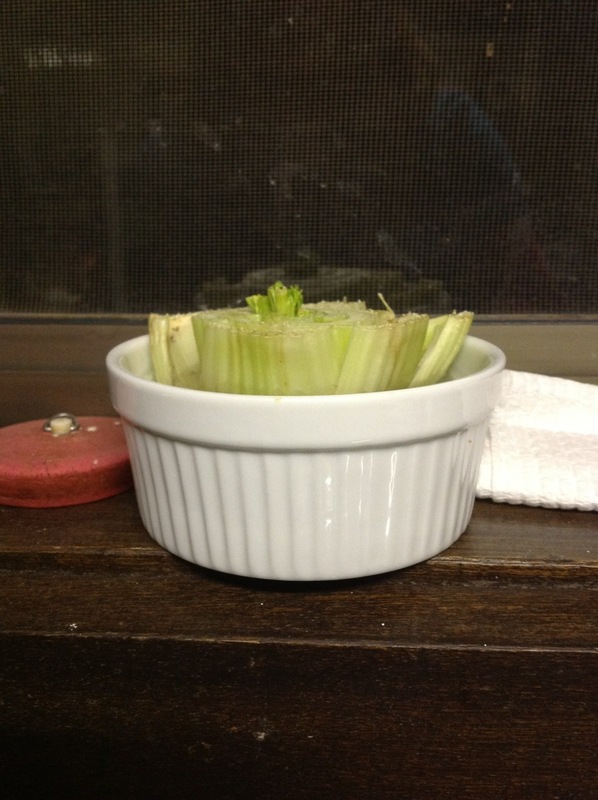 However, instead of using seed or seedlings, I’m going to recycle an old celery! 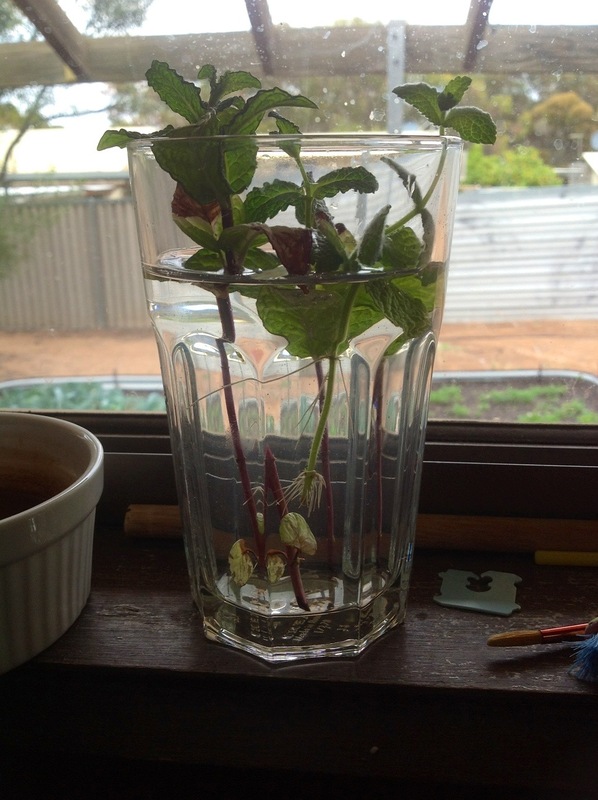 Well not so much recycle, but regrow. Since celery is a plant that grows from the centre outside at the base, if you cut off the base you can use it to grow a new celery plant, or rather continue to grow the same plant. The method for doing this is fairly simple. Step 1:Cut off the base of the celery. By the way use as much of it as you can first, don’t just buy a celery from the supermarket to cut off the base and throw the rest away, it kinds of defeats the point. This can also work on celery that is a bit past being edible, but it depends on the stage of decomposition. 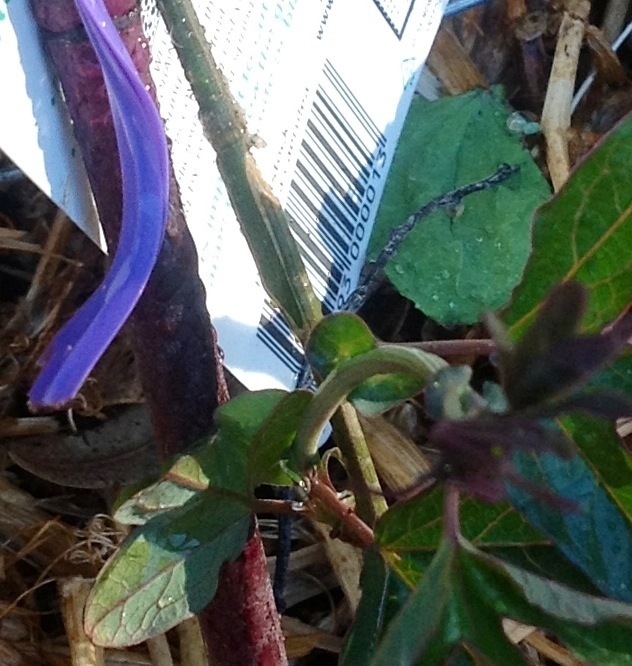 If the whole plant is black and slimy, probably not. 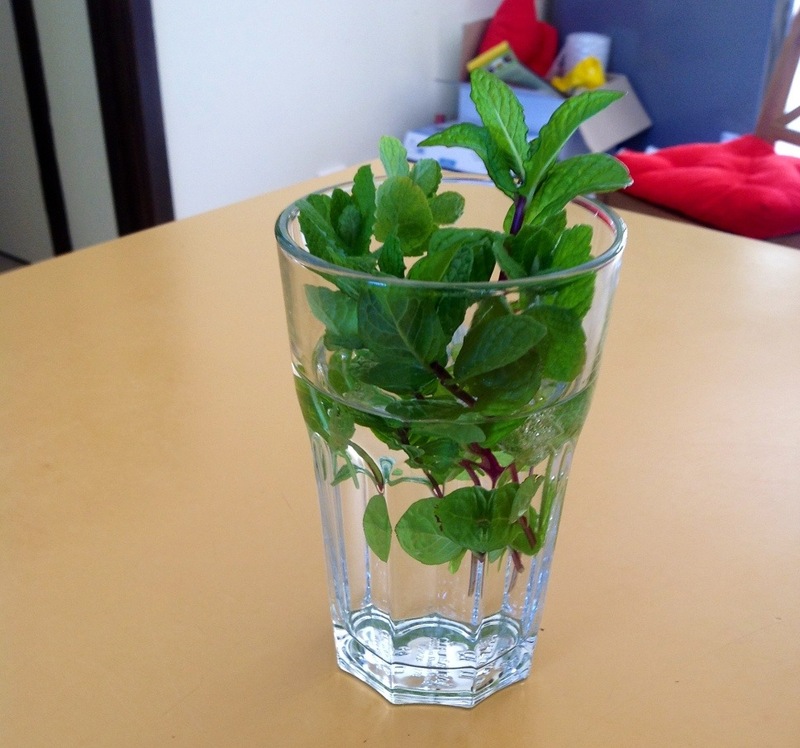 Step 2: Place the cut base in a container with some water and sit in a warm, sunny place, like a windowsill. The celery in the above picture looks a bit anemic. 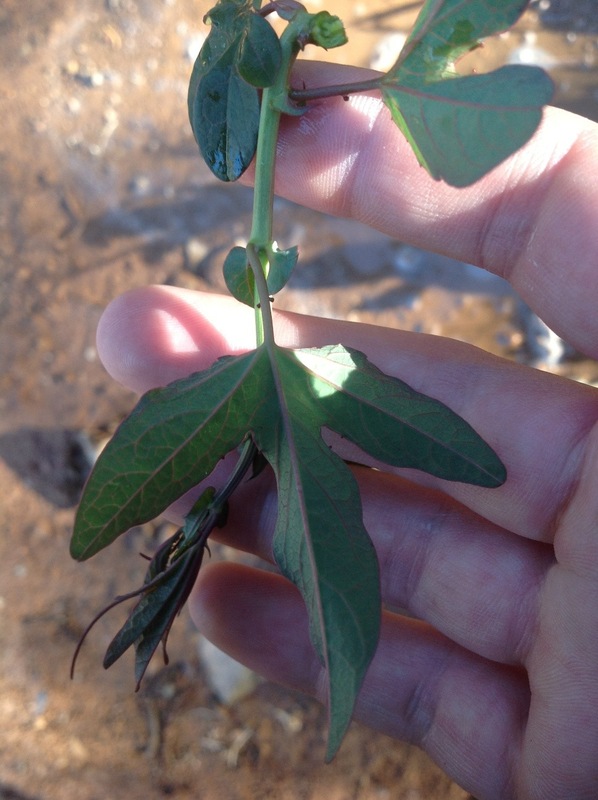 I found it in the back of the fridge drawer, don’t know how long it has been there, it is a different plant to the one in the rest of the photos. Also, the windowsill doesn’t look that sunny in the photo, it was taken at night. Step 3 Wait. About a week or so. 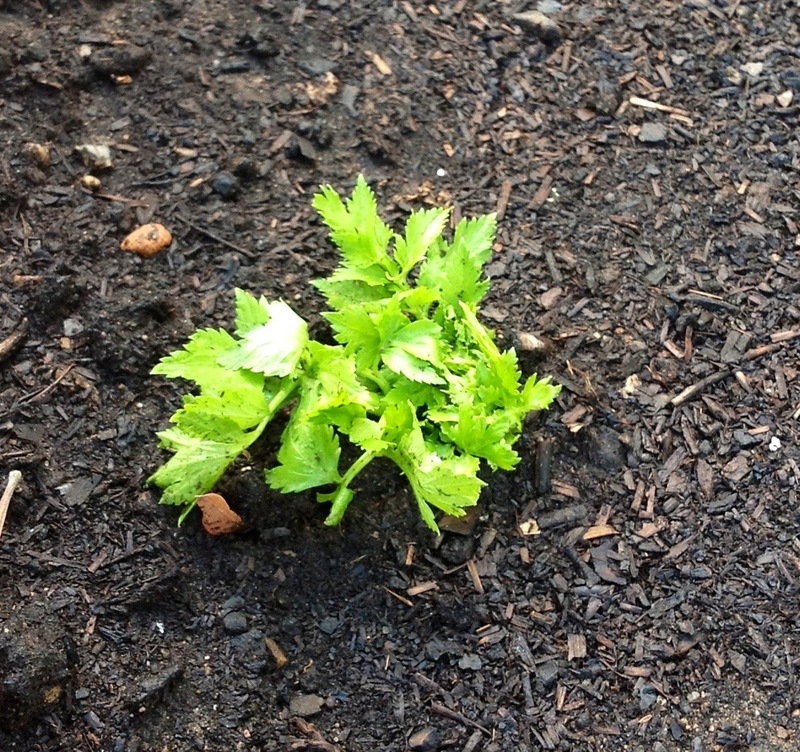 You should see the celery putting up new growth from the middle. 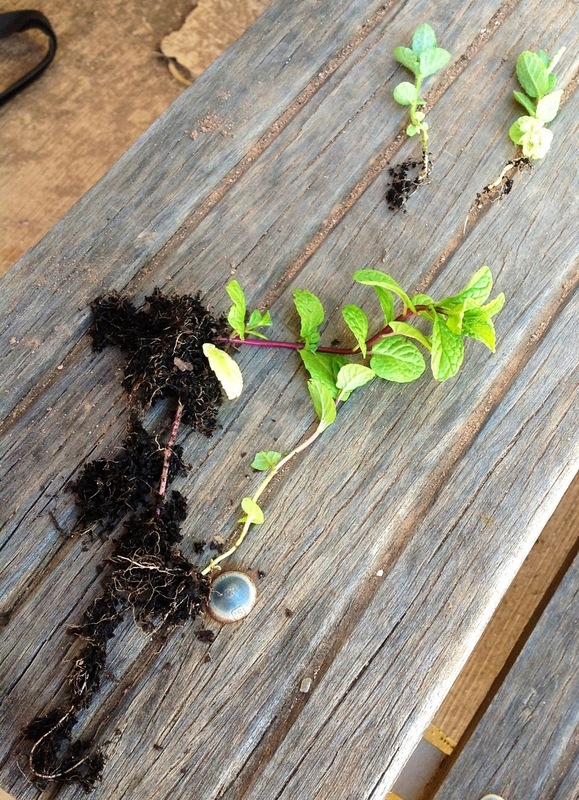 It will start out yellow, but turn green once it has been exposed to light for a while and had a chance to photosynthesise. Step 5 Plant the celery in a pot or garden bed once you have enough growth to plant the base while still having a bit of the growing green bit above the earth. 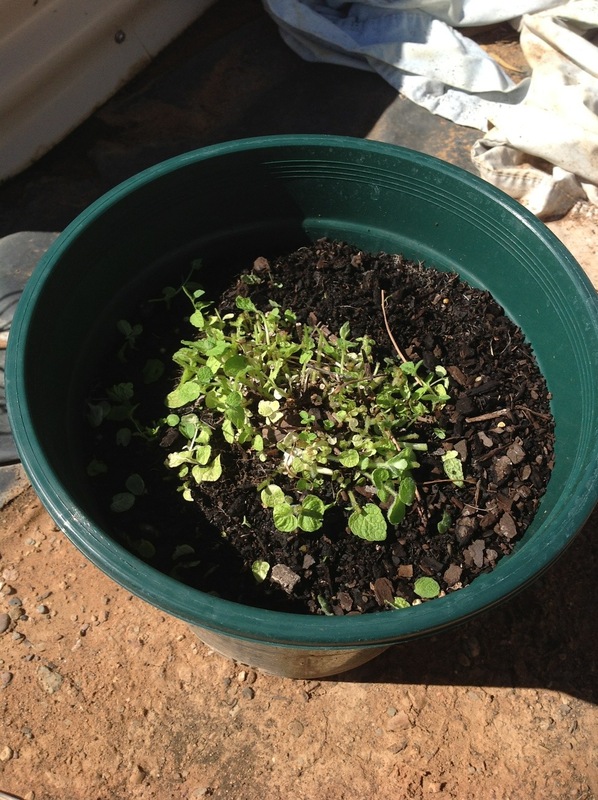 I planted mine in my garden bed where there was a lettuce that bolted to seed and died. Step 6 Wait. Again! Celery takes a long time to grow. 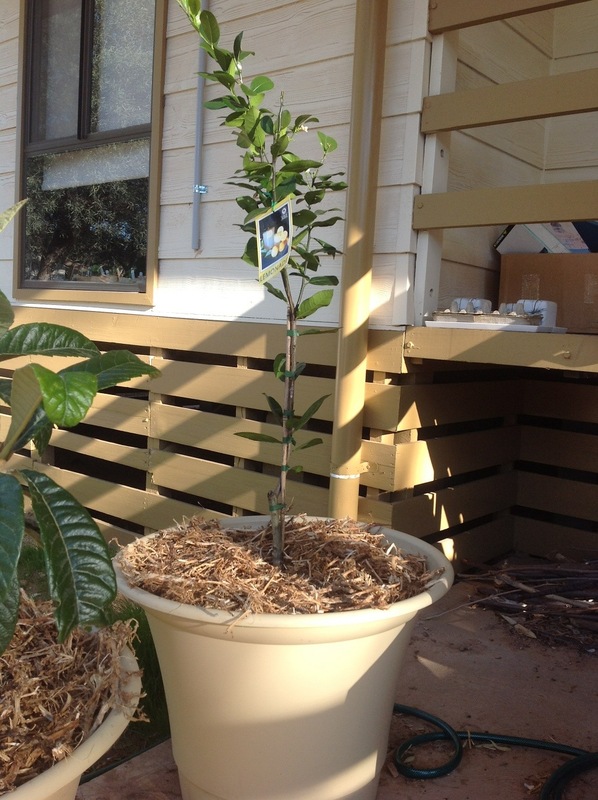 About 4 months to get to supermarket size, and puts on most of its growth towards the end of its life. If you don’t think you can use up a whole celery at one time you can treat it as a cut and come again crop, just taking as much as you need at the time. 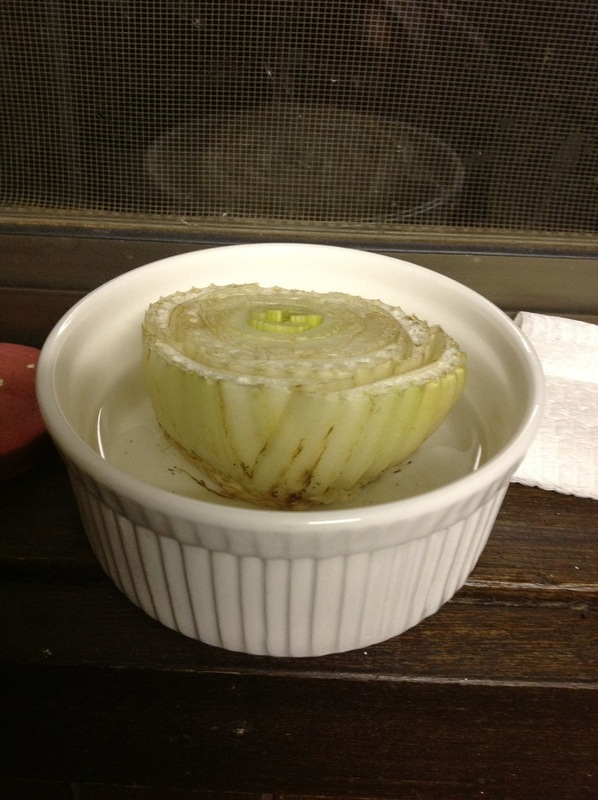 Other plants that grow in similar methods to celery, such as bok choy, can also be regrown using this method. 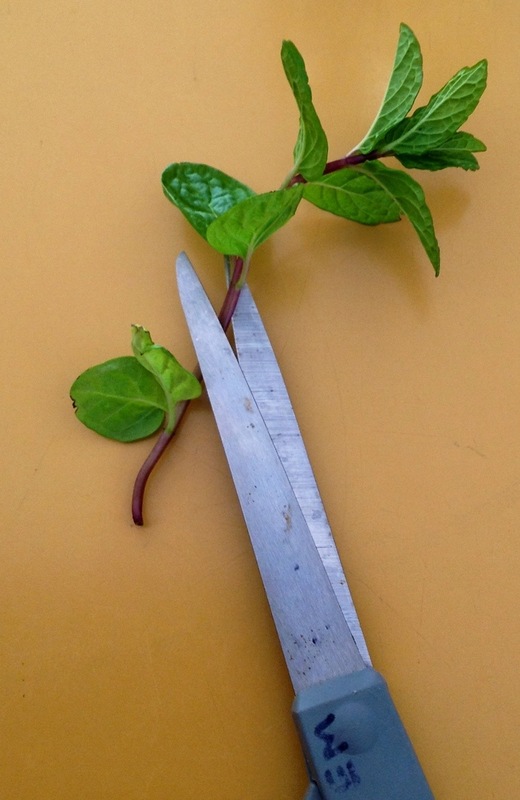 In fact there are many plants that can be regrown from scraps such as spring onions, sweet potatoes and more. Hit up google for more info. In a few months, or sooner, I’ll do a follow up post on the success/failure of this experiment. For the mean time I’m more than halfway through The Slap by Christos Tsiolkas. 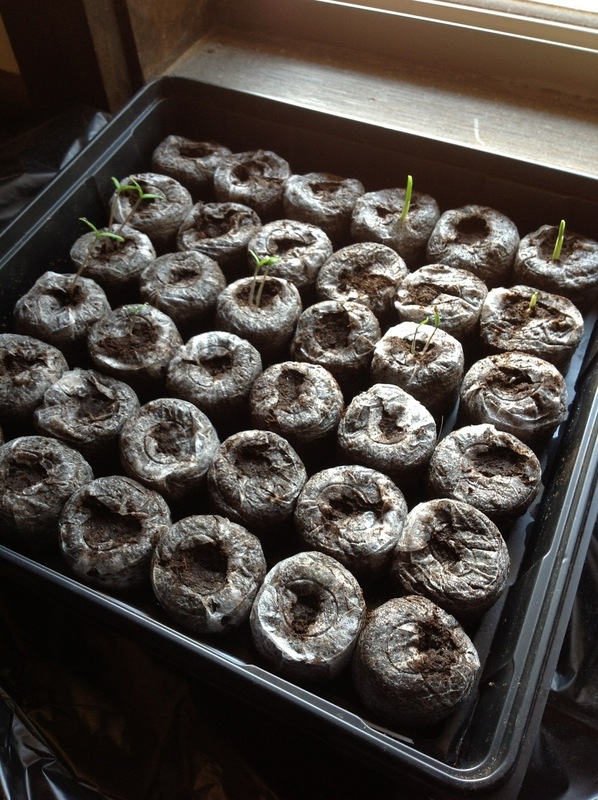 The seeds I’m starting indoors have all begun to germinate and so far, are flourishing. 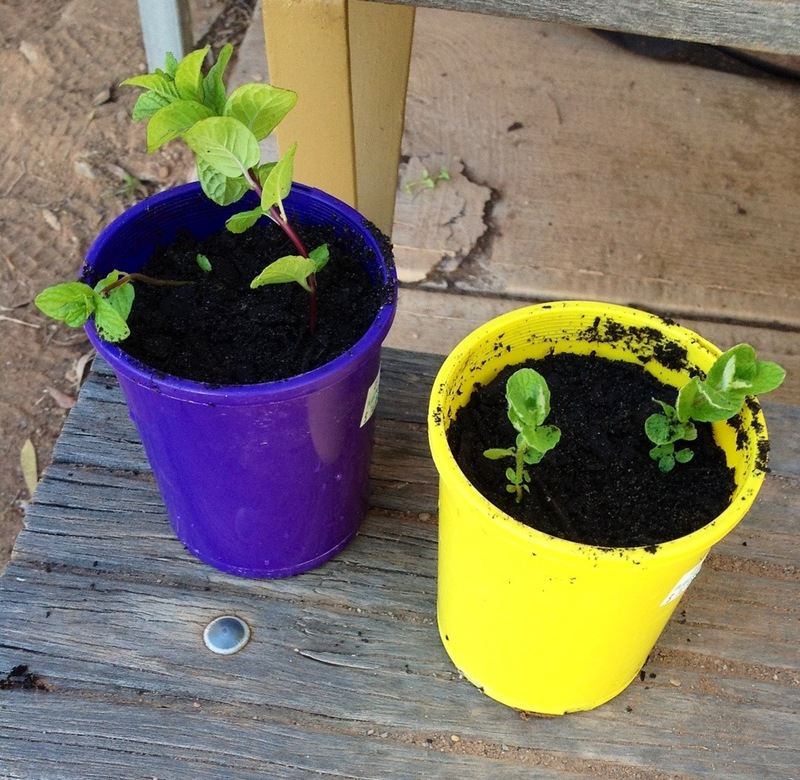 I have used two methods of starting seeds: newspaper pots with potting mix and jiffy 7 pellets. 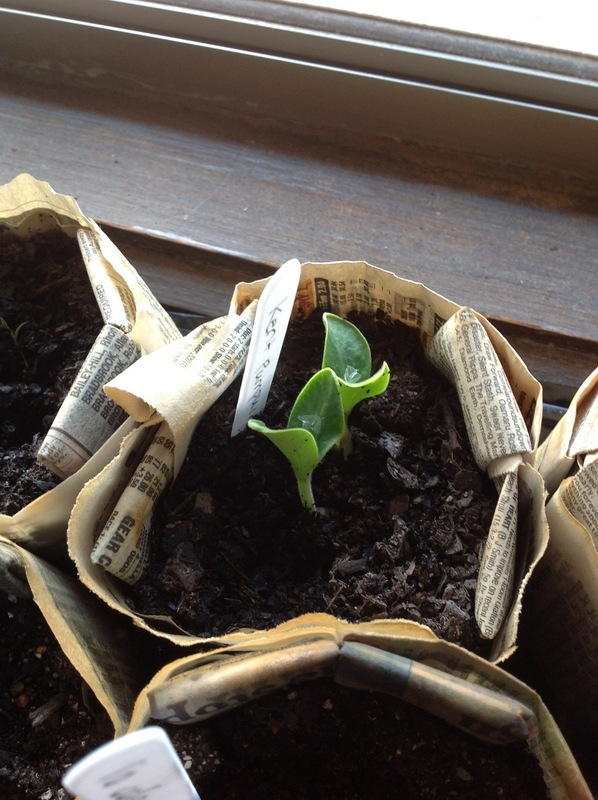 As our school has been suffering under mountains of newspaper thanks to an Olympics promotion, I decided to start some seeds in newspaper pots. I used an origami method, which is really based on a traditional design, but which is floating around on the internet as a method for making newspaper pots. 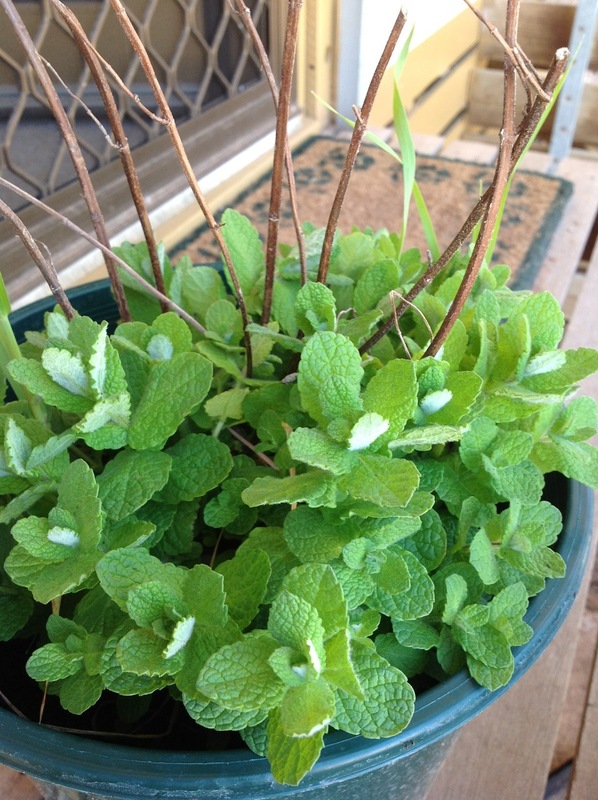 If you want to try making your own I recommend visiting For Greenies as their instructions and photographs are easy to follow. There are many other methods out there such as rolled paper pots and pots made using commercial pot makers, but this is the method of choice for me. I filled my pots mostly with seed raising mix, although I ran out and had to use regular potting mix for the last few, but it doesn’t have bothered the seeds much, it may with seeds that are a little harder to germinate I’m not sure. I planted 2/3 seeds per pots depending on the germination rate of the seeds and so far have at least one plant for each pot which was my aim. I started off watering with a spray bottle but once the seeds were more firmly embedded/started germinating I have just been tipping a little water into each pot most days. The newspaper is beginning to yellow but I think they should hold together until planting time. The other method of starting seeds I am using is Jiffy 7 peat pellets in a Jiffy Pro ‘greenhouse’. 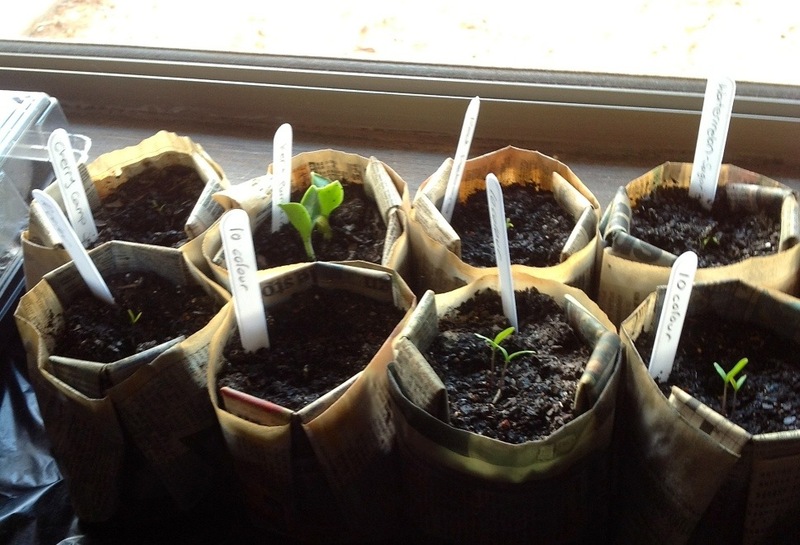 These seeds were planted 5 days after the ones in the newspaper pots so they have not reached the same level of germination as the others but are coming along nicely. For those of you not aware jiffy pellets are small pellets of peat which can be hydrated with water and used to start seeds. They are relatively inexpensive, particularly if you already have trays you can put them in. you can buy 500 from ebay/various websites for about $50-$70, maybe less if you really shop around. 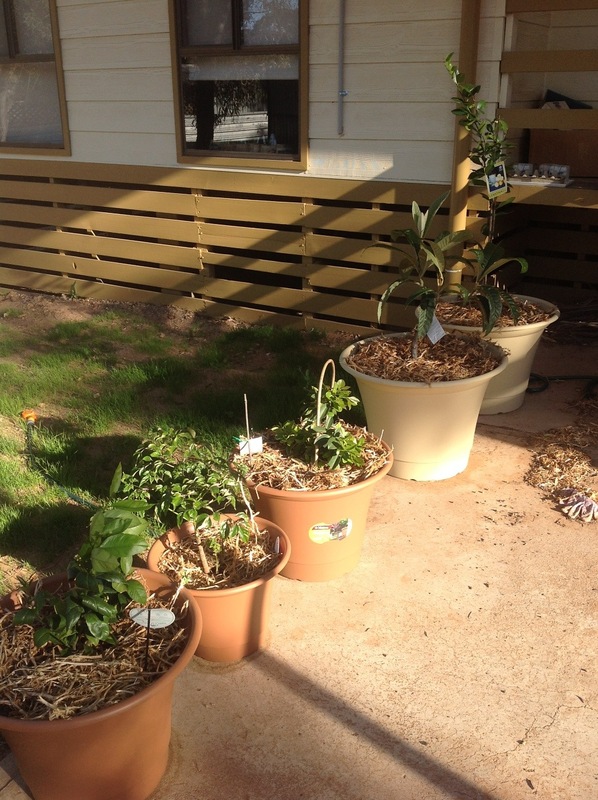 There are some criticisms of peat pots and pellets. There are questions about whether the peat is sustainably harvested. 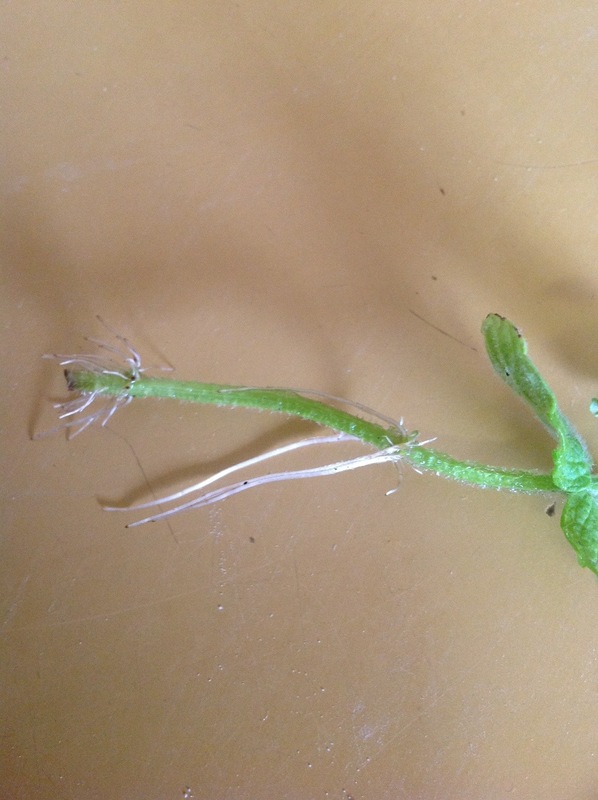 Also some people say they are too small for the root system and by the time plant is significantly developed enough for the seedling to be planted outdoors with a reasonable chance of survival the roots will be strangled. However I don’t think at they are significantly smaller than standard seedling punnets. 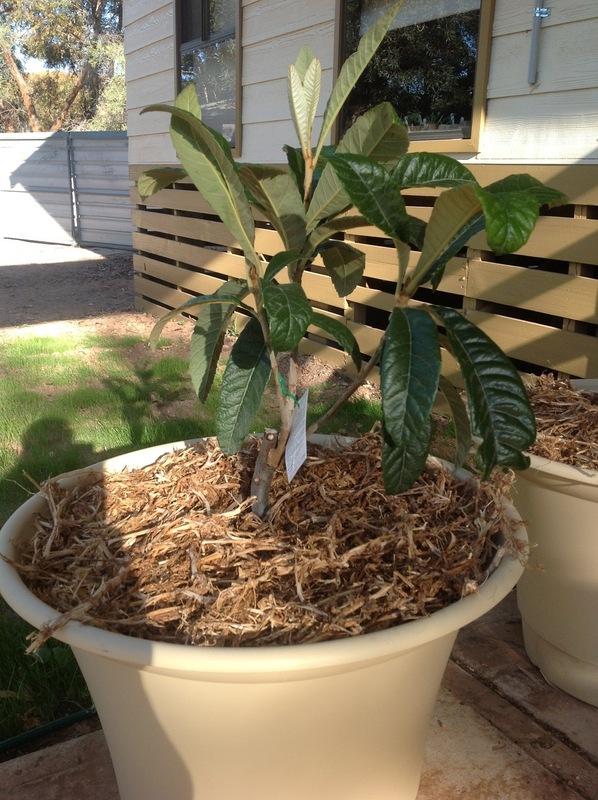 Both of these methods are designed for the seedling, growing material and container to be planted directly into the ground when the seedling is significantly developed. 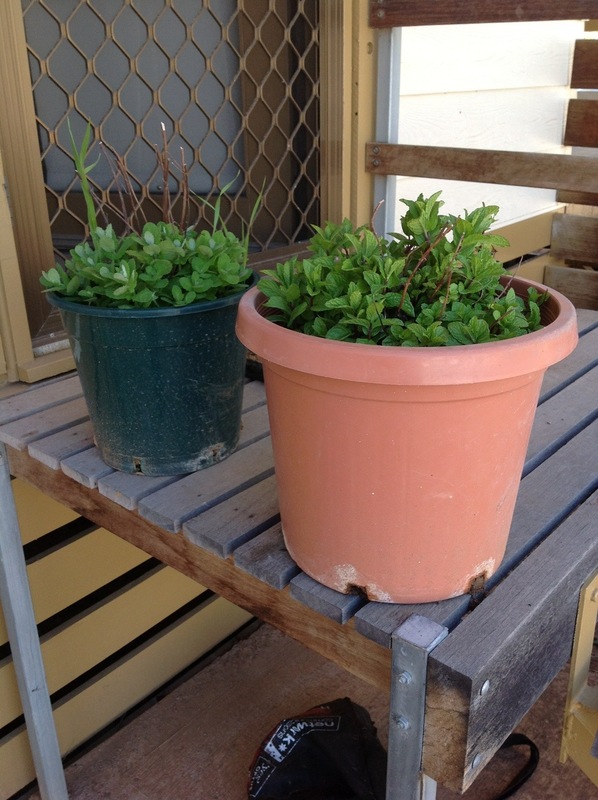 So for now it is just a case of watering and maintaining them for a few weeks. Not long ago I planted sunflowers and am now seeing some major germination action! 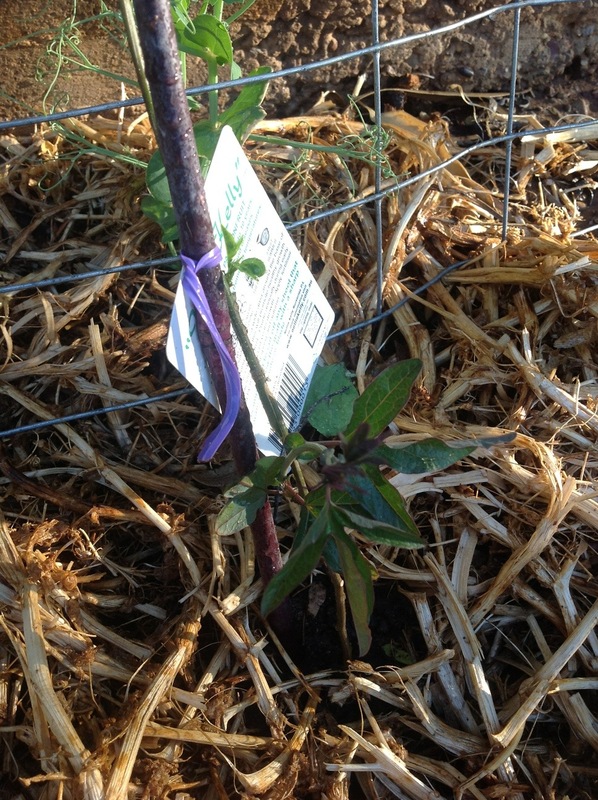 I planted two varieties, Evening Sun and Sun King in an interchanging pattern along the fence line. 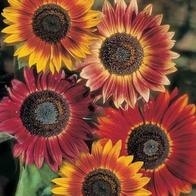 My vision is to have a row of big beautiful sunflowers along the fence that I can look at through my kitchen window, so I hope they grow well, unlike my last attempt at growing sunflowers which ended in my brother ‘weeding’ them all out. I initially protected the seeds from birds using small disposable shot glasses as apparently sometimes birds will dig up and eat your seeds before they have germinated. 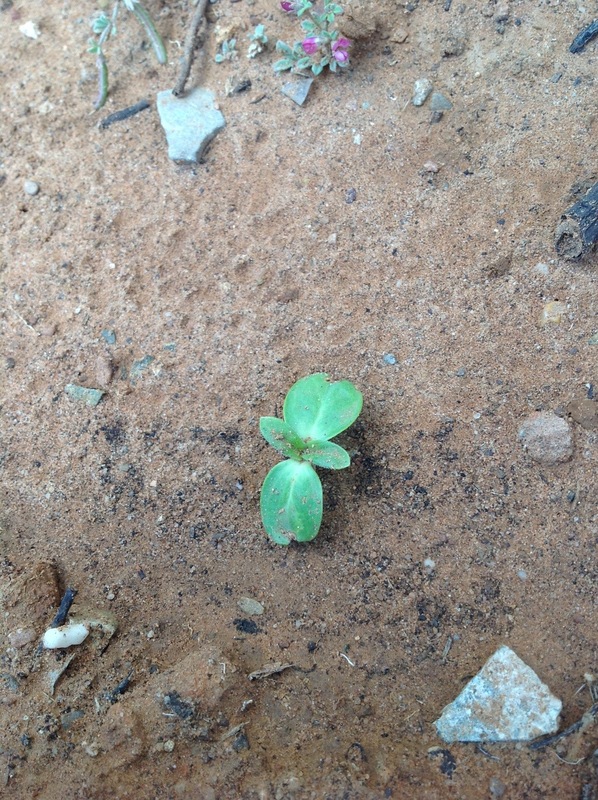 I planted two seeds at each site and have thinned to the stronger of the two seedlings where two germinated, although I was surprised how strong the roots were for such small plants. I now have a better understanding of how those long, thin stalks support such large heads. 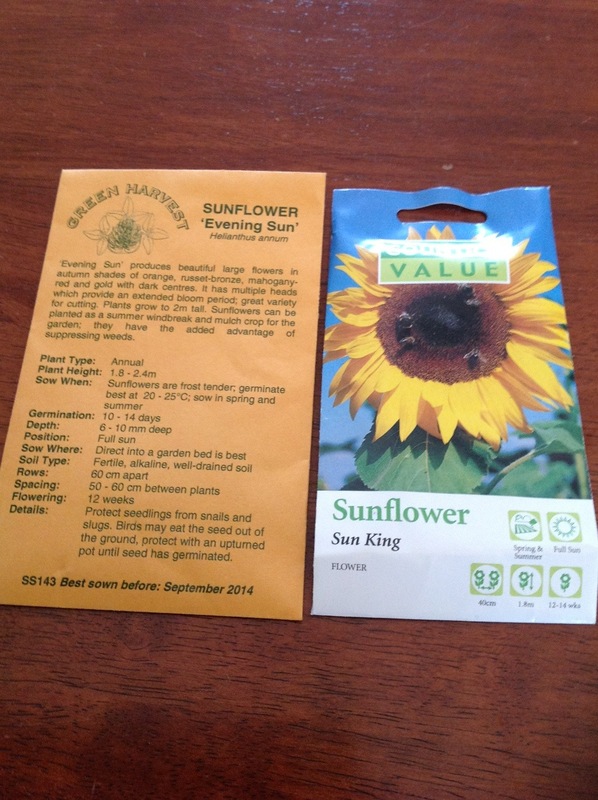 I am hoping to save seeds from some of these sunflowers so I made sure not to buy hybridised seeds. However according to the Seed Savers Handbook multiple varieties can cross pollinate, so results are not guaranteed, which doesn’t really bother me to be honest as I find the idea of the possible cross breed an interesting one. I also still have plenty of seed left so if I want to save true to type seed I can plant a single variety in the next couple years and then save seed. Anyway, spring is still sprung here in the garden so there is plenty for me to get out and do. Finally after months of planting and tending and waiting I was finally able to pick and eat something from the garden, other than lettuce that is. First crop peas and they were delicious! 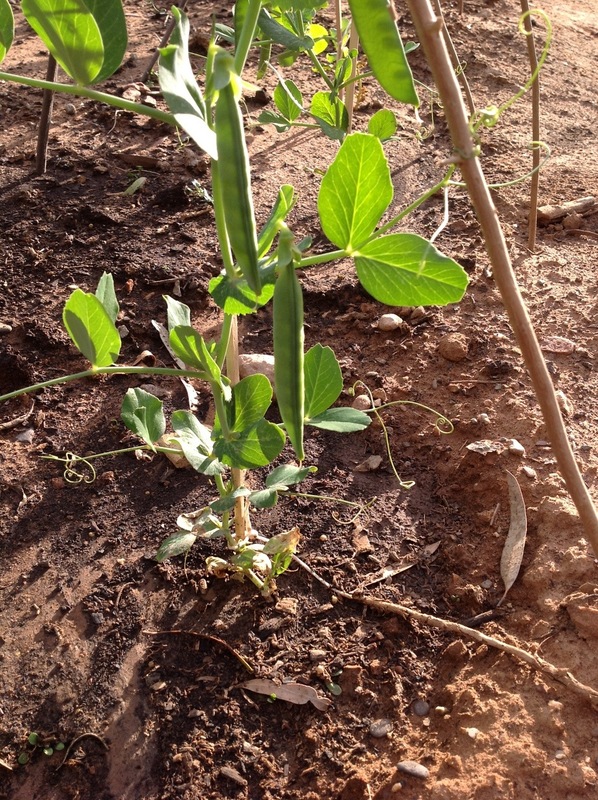 I originally planted the peas on the 3rd of June and they are growing so well that they have produced peas already. According to the weather, the garden and the general landscape spring has most definitely sprung. Hopefully the pea plants will continue to grow and in a month or so there will be a main crop, although perhaps a little earlier than expected, but still nice. This weekend I set up some towers to grow potatoes. The main idea is that you create a vertical tower for around your planted potatoes and as they grow you top it up with soil or mulch so that the potatoes grow in the tower rather than under the ground. They are a great way to save space in a small garden, not so much of a concern for me, and apparently increase the yield two to three times. I’m not sure if that is true but we’ll see in a few months. A lot of people say to use old tires but being that i don’t have any, I followed a tutorial from sunset.com and made mine from mesh and cheap bamboo screening from the reject shop. 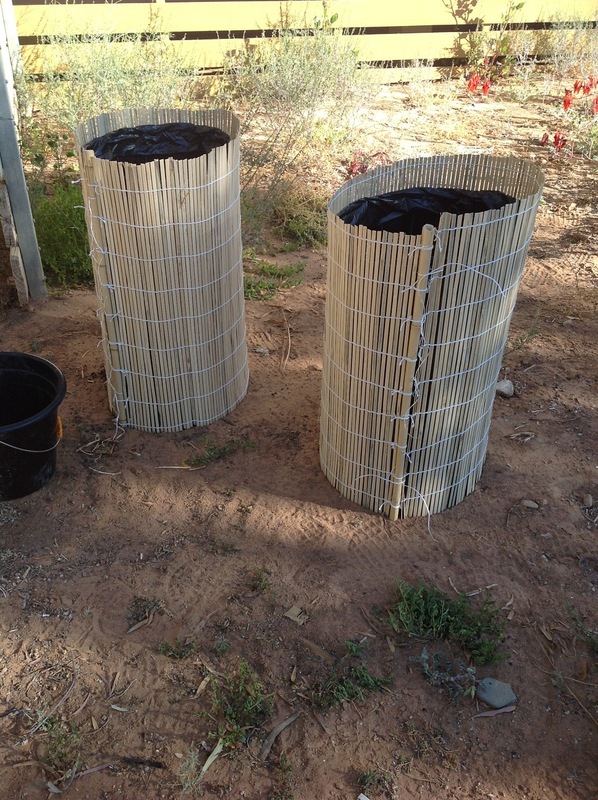 However, differing from their tutorial I lined my towers with heavy duty garbage bags to minimise light filtering through the sides as I don’t want a whole crop of green potatoes. Another good trick I found was to out the cut end of the wire downwards and use it to anchor the towers to the ground. I don’t have photos of the construction phase as my ipad was flat, however the ones in the tutorial are good. Hopefully in a few months there will be a crop of home grown potatoes to post about!